With Patch 1.65 in full swing this holiday season, players have gotten to experience Japanese armour in its initial form. The long awaited tech tree that players have finally gotten their hands on, which had seemed nearly impossible not even 6 months ago. As Japanese tanks go through their closed beta test, players will eventually need some premium vehicles to aid their progression through the new tech tree. Gaijin has previewed the first Japanese premium tank that can be purchased with Golden Eagles not too long ago. Today we will take a look at the Chi-Nu II. With the reality of an imminent American invasion of the Japanese home islands, Japan understood the need for developing tanks fit to defend against the American unit’s. The primary medium tank used throughout the war had been the Type 97 Chi-Ha, which was initially developed in 1936. Its armour was weak, its mobility outmatched, and its firepower now obsolete (despite its armament upgrade to a high velocity 47mm in 1941). Japan initiated three new tank programs in order to design and produce a new series of tanks capable to handle the Sherman tank face-to-face. The end results were the Chi-To and Chi-Ri medium tanks. Both of these vehicles were to use the powerful Type 5 75mm anti-tank cannon, which was certainly more than suitable to deal with Sherman’s and most other Allied tanks. However, these tanks would take time to produce in any sufficient numbers, and Japan needed an immediate solution. To counter this issue, the Japanese decided to put the initial Chi-Ri I turret design (production model Chi-To turret) on the Chi-Nu chassis and mount the new Type 5 75mm anti-tank cannon in the turret. This makeshift tank would become the Type 3 Chi-Nu II. Type5 75mm anti tank gun. The Chi-Nu medium tank was Japan's last tank produced in large numbers, with 166 of them completed before the end of the war. It had been dubbed “The Last Line of Defense” for the tank corps. The Chi-Nu was armed with a turret-mounted variant of the Type 90 75mm field artillery cannon, the Type 3 75mm cannon. It had been chosen for its proven adequate combat performance against Sherman tanks in the field. The Chi-Nu turret’s had been rapidly produced off of the original Chi-Ri turret schematics, leaving many flaws in the design which would become apparent with the Chi-Nu’s. One such flaw was the lack of proper ventilation ports for the main cannon. Most of the discharge stayed inside the turret, eventually intoxicating its crew over a sustained period of firing. Many other small design flaws were scattered around the tank. Because of this, the head staff of the army realized the Chi-Nu needed to be standardized. By 1945, the Type 5 75mm anti-tank cannon had finished its development. The cannon was successfully mounted in tanks such as the Na-To prototypes, the Chi-To prototypes & the two completed production model Chi-To’s, and the Chi-Ri prototypes. These prototype tanks were nearly done with testing, and would be capable of reaching mass production by the end of the war in sufficient numbers, but Japan did not have the time. In order to shorten the time in which the new anti-tank cannon could see operational status in vehicles, the Chi-Nu (which had been in production since 1943) was selected to become the rushed answer to Japan's problems once again. Chi-Nu II. Never officially designated. It is the second production iteration of the Chi-Nu tank. The Chi-To had been accepted into service as the Type 4. The tank's prototypes had been designed with a turret size larger than the production units. It was decided to use these, which were still equipped with Type 5 75mm cannons, to be mounted on the Chi-Nu chassis. In March of 1945, the Imperial Staff Office took one of the prototype Chi-To turret’s and mounted it onto Chi-Nu chassis No. 37 of Showa 19. The tank was labeled as the Chi-Nu Kai. On March 19th, the Chi-Nu Kai was sent to the Irago Firing Ground’s and performed a number of trial tests to determine the combat capability of the Type 5 75mm cannon. Test results came out overwhelmingly positive, and almost immediately the tank was scheduled for production, but the production model Chi-To turret design was chosen over the prototype turret design. Chi-Nu Kai according to Tomio Hara. National Archive File C14011034800 - Chi-Nu production status as of Showa 19. Production of the Chi-Nu II was delayed due to the war coming to a close. The Mitsubishi, Sagami, and Itachi factories, which were producing the Chi-Nu, were left unscathed during America's bombing raids. However, Japan was no longer capable of maintaining enough resources to mass produce armored vehicles by this time. Only a few Chi-Nu II’s were completed. Full scale production would have started with Chi-Nu chassis No. 211, but it never came to be. Wouldn't it have made more sense to have this in the TT and the Kai as premium? Yes, technically. However since this is a much quicker option to implement it is most likely why Gaijin went with this to give it to players sooner. Down the line they may do a tank swap. Who knows? Let's hope :D Because otherwise the medium line is quite scarse. If the Chi-Nu II uses the Chi-Ri's initial turret (Chi-To's production turret), then why does it have only 50mm on the front? Shouldn't it be 75mm thick? Armour was refitted for the Chi-Nu to match the frontal hull armour. According to the article, they only used the design, i.e. shape. About the Chi-Ha Naval (aka the deathly 30mm of Derp - HA! ), have you gotten an answer from the Gaijin as to whether it and the other Japanese tanks you mentioned since the release will receive their full variety of ammo types (not to mention damage, performance, visual models, and resulting BR revaluations)? Also, why does the HEAT rounds of the 120mm Chi-Ha pen 30mm no matter the range nor impact angle while the 57mm Ho-I pen differently at certain angles (assuming range is a neglegent factor)? HEAT in general seems to be a bit, odd. But I'll see what I can do. That's because this is Chi-Nu 2 not Chi-Nu kai. Chi-Nu 2 was fifted with type 5 cannon but the turret is chi-nu turret. Chi-Nu kai refitted in both new cannon and chi-to turret (75mm thick at the front), and we still do not have that in the game but hopefull it will come. didnt know you read this blog too miles, a Q&A would be nice!!! The fact that the initial Chi-To prototype turret was THAT large compared to the production is pretty hilarious and odd. Can't wait for the Chi-Nu II though. Wonder how they're going to do way with the Chi-Nu II and the Kai. It was a testbed vehicle, afterall. They can appear fairly, unique. Any difference of gun depression between the production and prototype turrets? Tanks with type 5 75mm are still have too long reload and are missing shell. Type 3 75mm guns are still missing Tokku Ko APHE. Don't get me started on Chi-Ri, it's Autoloader was so poorly implemented. Yeah some of these tanks rlly need their better shells, especially the Chi-Ri since at that br its facing higher tier vehicles. Any information if some of these shells are being worked on by Gaijin, such as the ones from the short 120mm gun and so on? 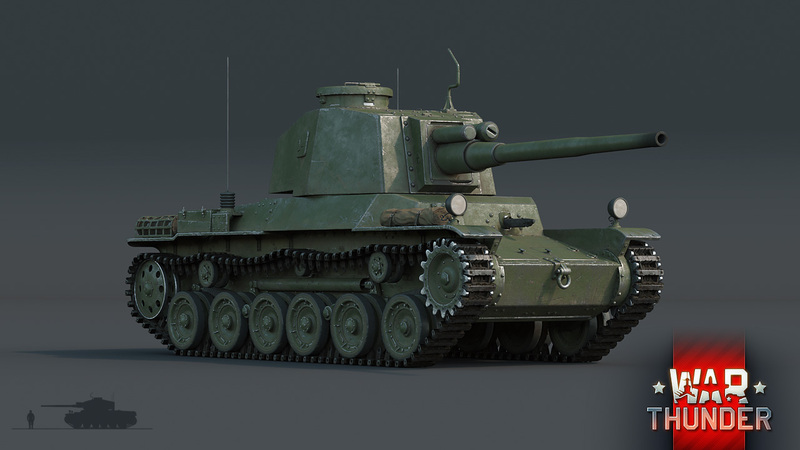 if you consider the volume of the japanese tank development and the "break" they took until starting to work on STAs and STBs it really will become a pain if they start using some of the few vehicles available as premiums, instead why not do like in the early years of War Thunder and copy tanks already available in the game as premiums with unique liveries? be it either a specific unit or specific commander/"ace"
The fact that the initial Chi-To prototype turret was THAT large compared to the production is pretty hilarious and odd. I'm a bit concerned about the Chi-Nu 2 is installed with the turret of chi-to production. Is not the Chi-Nu 2 turret exactly the same as regular Chi-Nu ? I mean it looks just exactly the same except different gun mantlet. It also has the same armor values as normal Chi-Nu, 50 front and 25 side and rear. But when you look at the armor values of Chi-To production turret it has 75front, and 50sides same as Chi-To proto but not as Chi-Nu 2 ??? I know for a fact that the Chi-nu kai has the turret from the Chi-To prototype, no?